News just in that HTC are about to release an HTC One in real gold. That is, not a gold coloured phone but an actual 18ct gold phone. They are doing this to celebrate the 18th anniversary of the MOBO awards on the 19th October. If you fancy picking up one of these bad boys then it’ll set you back £2750 and with only 5 in existence you’d better act fast! London, 8 October 2013 — HTC UK, a leader in mobile innovation and design, today announces the release of the Gold HTC One, created using REAL gold. Produced to celebrate the 18th Anniversary of the MOBO Awards, this very limited edition phone will be presented to the winner of Best Newcomer category sponsored by HTC at this year’s ceremony in Glasgow on 19th October. Valued at £2,750 and with only five in existence, the limited edition Gold HTC One is the most exclusive and expensive smartphone ever created by HTC. It was crafted in partnership with Goldgenie founder Laban Roomes. To achieve this luxury look, the zero gap unibody of the HTC One on the front and back is plated in 18ct gold. It is polished to give a sophisticated finish and a special MOBO 18 logo is laser etched on the rear of the device. These elements come together to create the ultimate recognition for the prestigious music awards show. 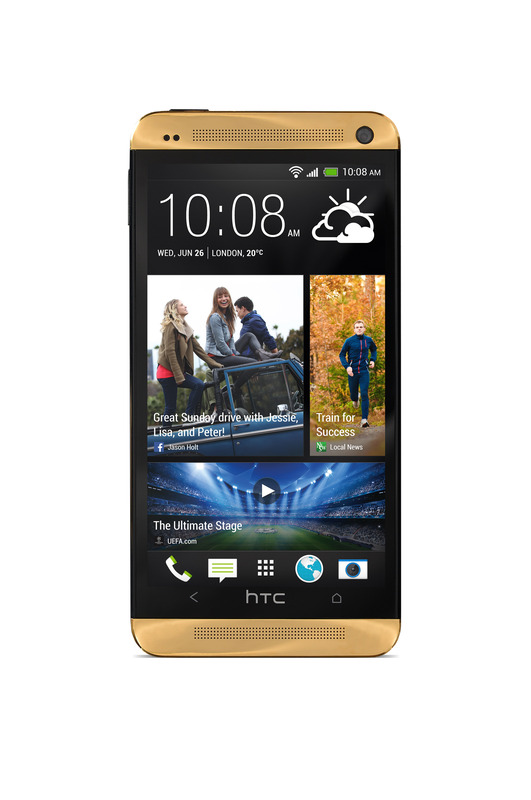 The Gold HTC One includes all the performance of the award-winning HTC One, including HTC BlinkFeed™, HTC Zoe™ and HTC BoomSound™, together reinventing the mobile experience and setting a new standard for smartphones. Goldgenie has previously made bespoke phones for Denzel Washington, Will Smith and Kate Moss, but this is the first time they have worked directly with an Android manufacturer. Since its launch, the HTC One has attracted a host of editorial and industry awards which recognise its superior performance and new benchmark in design. Just last week the HTC One collected Gadget of the Year, Phone of the Year and the Design Award at the T3 Gadget Awards 2013. Other highlights include the GSMA’s Global Mobile Award for Best New Mobile Device or Tablet at Mobile World Congress 2013, Computex Taipei’s Gold Medal in Design and EISA award for Best European Advanced Smartphone 2013-2014.